MI-DEL Product Review + Giveaway!!! How many of you are looking for a delicious gluten free cookie that is available at most mainstream grocery stores? Well, you are in luck because MI-DEL is just the product for you! 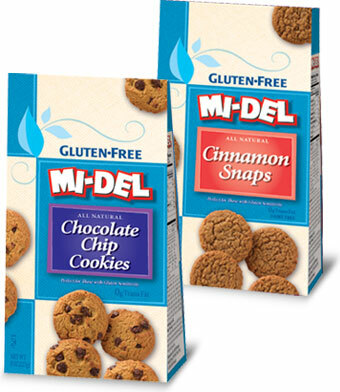 MI-DEL makes an assortment of gluten free cookies that can not only be found at health food stores but at mainstream stores such as Stop & Shop and Waldbaums. MI-DEL was generous enough to send me coupons to receive 3 free products. I decided to sample the Arrowroot Cookies, the Pecan Flavored Cookies and the Chocolate Sandwich Cookies. I loved each of the cookies - they were all the right texture which can be difficult to find in a gluten free cookie. The Chocolate Sandwich Cookies I enjoyed while dipping them in a glass of soy milk. For more information, please visit them at www.midelcookies.com. If you would like the chance to win a coupon for a FREE MI-DEL product, send me an email at MsCeliacSays@gmail.com with "MI-DEL GIVEAWAY" in the subject line and the name of the MI-DEL product you plan on purchasing with your free coupon in the body along with your shipping address. Please make sure to enter this contest by June 3rd at 12 noon EST. At that time, 3 winners will be selected! Enjoy Life has long been one of my favorite gluten free brands! Since trying their "boom Choco boom" bars in the fall, I have eagerly been awaiting the release of more delicious chocolate products from them! Well, now the time has come. They have just released two new products - Double Chocolate Crunch Granola and Semi-Sweet Chocolate Mega Chunks! The Double Chocolate Crunch Granola is a great breakfast treat and something to look forward to so that it's easier to get up on a dreary morning! It is composed of chocolate granola and tons of semi-sweet mini chocolate chips! It would also make a great afternoon pick-me-up! The Semi-Sweet Chocolate Mega Chunks are the perfect ingredient for baking the most chocolate-filled cookies or brownies! They are even enjoyable to just eat on their own! I still find it so hard to believe that their chocolate products are gluten free and dairy free and are still absolutely delicious! In fact, they are free of wheat, dairy, peanuts, tree nuts, egg, soy, fish, shellfish and are also made without casein, potato, sesame and sulfites. They are even certified Gluten Free by the Gluten Free Certification Organization (GFCO) and are Kosher-certified by the Chicago Rabbinical Council (cRc) and Halal-certified by the Islamic Food and Nutrition Council of America (IFANCA). All Enjoy Life products contain no artificial ingredients, trans fats or genetically modified ingredients! You can purchase these new Enjoy Life products at Ms. Celiac's Market or at your local health food store or grocery store! They are available throughout the United States and Canada. Time for Nutella Rice Krispie Treats! Since I was recently sent 2 boxes of the new gluten free Rice Krispies cereal from Kellogg, I decided it was time to experiment with some recipes! I decided on making gluten free Nutella Rice Krispie Treats. These are very simple to make and only take about 15 minutes to put together! Stir in Nutella until melted. Add Rice Krispies cereal and stir well. Using your hands, press mixture into a 13 x 9 inch pan coated with Pam's Original Nonstick Cooking Spray. Once cooled, cut into squares and serve! Gluten Free Crepes in Park Slope, Brooklyn! For those of you in Brooklyn or nearby, I recently discovered a small crepe and espresso bar located in Park Slope. It's called Crespella (crepe in Italian)! As it turns out, all of their savory crepes are gluten free - made using 100% Italian chickpea flour! Crespella makes their crepes using the freshest ingredients available and they are made using organic ingredients whenever possible. The other day, I enjoyed the Tomato, Mozzarella & Pesto Savory Crepe (photographed above) and it was absolutely delicious! For more information, please visit their website at www.crespellabk.com or visit them on Facebook and/or Twitter. Crespella is located at 321 7th Avenue between 8th and 9th Streets in Park Slope, Brooklyn. It is right off the 7th Avenue stop on the F and G trains. For those of you that have been missing out on Rice Krispies cereal, well you are in luck! Kellogg is releasing a gluten-free version of this classic! Kellogg's Gluten-Free Rice Krispies cereal will be hitting store shelves in early June 2011! This certified Kosher cereal will be available to purchase in 12 ounce boxes. I just enjoyed a bowl of it this morning, as Kellogg sent me a complimentary box, and I must say I cannot distinguish it from the original version I used to eat as a child. In a large saucepan, melt butter over low heat. Add marshmallows and stir until completely melted. Remove from heat. Add Kellogg's Rice Krispies Gluten-Free cereal. Stir until well coated. Using a buttered spatula or wax paper evenly press mixture into a 13 x 9 x 2 -inch pan coated with cooking spray. Cool. Cut into 2-inch squares. Best if served the same day. For more information, please visit the Rice Krispies Facebook page and after May 10th, visit the Rice Krispies website for all the latest information on this new gluten free product from Kellogg's! Back in September, I first mentioned Chef Michelle and her gluten free baked goods after discovering them at the Farmer's Market at the Tanger Outlets at the Arches in Deer Park, New York. Well, this upcoming Memorial Day weekend she will be opening her own store, Ms. Michelle's Urban Gourmet in Bayport, New York. Everything in the store will be gluten free and they will sell items such as fresh muffins, pies, cakes, tarts, dry pasta, salads, breads, coffee, tea, espresso, sandwiches, soups and homemade gelato. In getting ready to open her own store, Ms. Michelle hosted a Gluten Free night at The Cortland in Bay Shore, New York on Saturday, April 30th, 2011. For the reasonable price of $15, you got a 4-course gluten free sampler meal and each course was paired with a different brand of gluten free beer! I only sampled Bard's Beer (made from sorghum) as I'm not a fan of beer and was only able to take a few sips until switching to a different drink. The first course included three baked clams which were made using Ms. Michelle's gluten free breadcrumbs. The second course was a gluten free cold noodle dish made using Ms. Michelle's gluten free rice pasta with fresh tomatoes and mozzarella cheese. The third course was a gluten free chicken toast that included chicken, portobello mushrooms, red peppers, and basil on Ms. Michelle's gluten free toast. The final course was a gluten free chocolate torte topped with raspberries. I loved everything I sampled and am looking forward to the opening of Ms. Michelle's Urban Gourmet! Are you looking for a healthy and nutritious treat that is great for on-the-go snacking? Well, Simple Squares may be the perfect treat for you! Recently, Simple Squares sent me samples of all 3 flavors of their nut and honey confections including rosemary, coconut, and sage. Each variety turned out to be delicious with just the right amount of flavor! Simple Squares were created by Kimberly Crupi Dobbins, a certified Holistic Health Counselor. These raw food treats are free of gluten, dairy and soy and contain no refined sugars. They are also kosher and contain 10% of your daily value of iron along with 6 grams of protein. The simple ingredients included in these tasty treats include: organic cashews, organic almonds, organic honey, unsweetened coconut, organic vanilla extract, sea salt and sage and/or rosemary (depending on the flavor). For more information, please visit www.simplesquares.com. You may also follow them on Twitter or "like" them on Facebook! Groupon, Living Social and Now Gluten Free Deals! Feel as if you're left out of some of the amazing offers on coupon sites such as Groupon and Living Social because you're on a gluten free diet? Well, Gluten Free Deals is a coupon site geared toward those of us living with Celiac Disease or Gluten Intolerance. Each week, Gluten Free Deals features a 50 - 70% discount on a gluten free product. Soon, Gluten Free Deals will be launching local deals for select cities including NYC, Austin, Texas, and Chicago, Illinois. You can sign-up for the local deals now! To stay up-to-date on their latest deals, follow them on Facebook and on Twitter.